Loose skin in the front of the neck can be tightened by cutting in the hairline behind the ears, lifting and redraping the loose skin, then trimming the excess before sewing up the incisions. If needed the neck muscles can be tightened as well. This is referred to as a neck lift and can be done as an independent procedure or as part of a facelift. In some cases men are willing to accept a direct neck lift, a smaller operation where excess skin (turkey gobbler neck) is removed in the area under the chin and in the front of the neck. The resultant scar usually blends well with even short beard hairs. A small chin can create a sense of facial imbalance and make one’s nose appear larger. Ideally the chin should reach close to an imaginary line dropped from the lower lip. 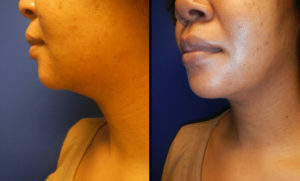 Insertion of a chin implant can improve chin projection and facial balance. Implants come in different sizes and can be further trimmed to customize the appearance. Swelling of the chin and lower lip after surgery can take 1-2 weeks to resolve with the final result apparent at 3 months. Chin implant surgery can be combined with either liposuction or a face-lift to improve the contour of the front of the neck. 31 year old woman. 5'10, 160 lbs. Had liposuction of her neck removing 25cc of fat. Photos taken 7 months postoperative. 57 year old man. 6', 250 lbs. Had liposuction of his neck 7 years prior, and had excess skin. Underwent T-Z plasty of his neck with touch-up liposuction to his left jowl. 7 months later underwent small office procedure to remove dog ears from the ends of his incision. 16 months after that had another touch-up in the office to improve excess laxity. Final photos taken 6 months after last revision.